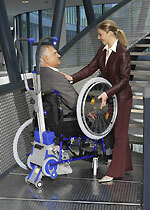 The Liftkar PLUS stairlcimber is equipped with a lightweight self-propelled wheelchair with already fitted staiclimbing mechanism. 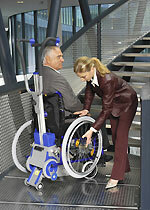 The client can move independently on the ground and when stairclimbing, just move the wheels of the wheelchair into a higher position thus creating space for the lifting unit. 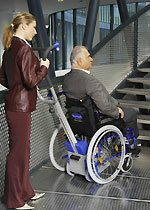 The Liftkar PT PLUS stairclimber comes only in one model: PT PLUS 115. 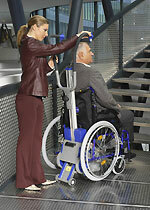 The maximum load capacity, so in other words the maximum weight of the transported person, is therefore 115 kg. The diameter of its non-marking wheels is 200 mm. Transport po schodech je pak stejný jako u ostatních modelů Liftkar.